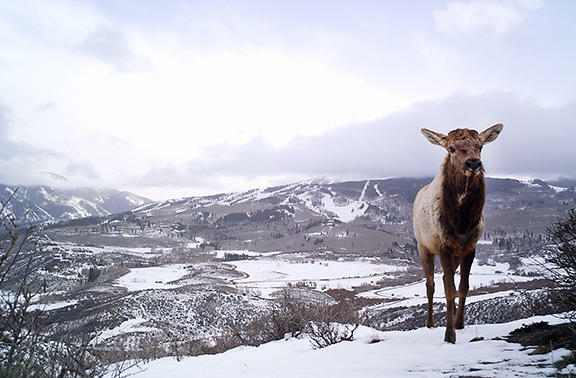 An elk wanders in the Sky Mountain area. Trails are closed for the winter to protect wildlife. The immensely popular Sky Mountain Park trails close Thursday for the winter season. Pitkin County Open Space and Trails lead ranger Pryce Hadley said the closures are key to protecting wildlife, especially elk, during the most stressful season. The closures are not limited to Sky Mountain Park; nearly 20 trails managed by Open Space and Trails have seasonal restrictions. Open Space and Trails staff monitor the closures with motion-sensing cameras and violators face a $100 fine. Pitkin County Open Space and Trails has opened a new world for mountain bikers at Sky Mountain Park since 2012, but some are saying it’s destroying a key habitat for area wildlife. Aspen Public Radio’s Elizabeth Stewart-Severy checked out the newest trail in the network to see how the program balances ecological concerns with growing demand for recreation. This fall, as thousands of hunters head into the Roaring Fork Valley’s backcountry, they may find more mountain lions, but fewer elk. Environment reporter Elizabeth Stewart-Severy has the details of this year’s hunting landscape. Mule deer may seem ubiquitous in the Roaring Fork Valley, but Colorado Parks and Wildlife say numbers of the species are below its target in some key areas near Rifle. The state agency plans to kill mountain lions and bears in an effort to help grow the deer population.